Nigeriaâ€™s quest to achieve the 30 percent national Broadband penetration by 2018 has received a major boost with the launch of MTNâ€™s 4G LTE service. With the launch of the service, MTNâ€™s subscribers can now enjoy optimized wireless 4G broadband and high-speed browsing experience which is the fastest and most futuristic mobile internet access available in Nigeria today. According to MTNâ€™s Chief Marketing Officer, Rahul De, the deployment of 4G LTE will not only enhance MTN subscribersâ€™ browsing experience but would also key-in to the national objective of attaining 30 percent Broadband penetration by 2018. â€œWe are excited to officially announce the roll-out of MTN 4G LTE services to our esteemed subscribers. The service supports most LTE devices, and leveraging on our network promises to be the widest LTE coverage in Nigeria. With the acquisition of the 2.6GHZ spectrum earlier this year, our objective was clear: to build capacity to accommodate 4G LTE into our services because it is the fastest wireless internet connection available today. In fulfilling that objective, we have embarked on aggressive optimization of our sites to beef up our capacity to take on the 4G LTE challenge. Presently, the service is available in Abuja, Lagos and Port Harcourt, with plans to roll-out to other parts of the country very soon,â€￾ he said. Speaking further, Rahul called on subscribers to visit the nearest MTN customer centre in the three cities to upgrade their SIM cards to U-SIMs to enable them enjoy the 4G service. He also added that switching to MTN 4G LTE will not attract additional tariffs for subscribers. 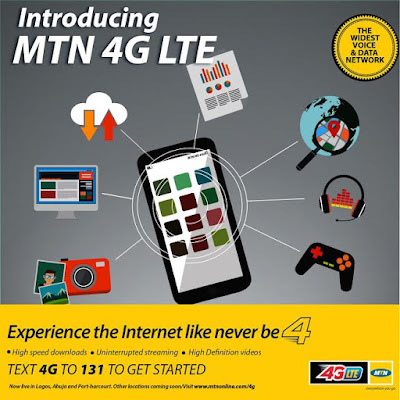 MTNâ€™s 4GLTE Broadband servicealsocomes with MI-FI device that canbepurchased atthenearest MTN friendshipcentre and allows for multiple userseither at home or office.